I compare this to Saint Paul’s instruction that we should “speak the truth in love” (Ephesians 4:15) — if we do so, we may offend the listener but our intent clearly is otherwise. Any offense is incidental, if not actually accidental. But if instead we speak the truth in order to offend, then the love we exhibit is more clearly love of ourselves, and that is vanity indeed. After all, we shade the truth when we care for a person and wish not to hurt them. Surely you have done so at one time or another: that suggestion was excellent; you did that very well; I would love to go with you to do that thing you want to do; and so forth. 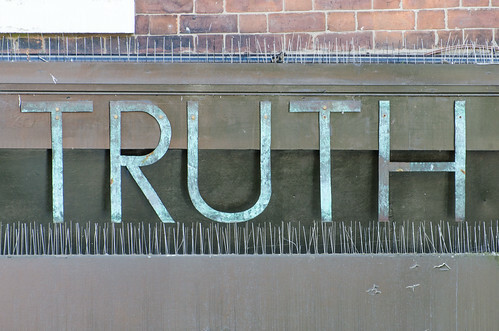 The more deeply we care for someone, the less likely we are to tell the bare, unvarnished truth. Our capacity for speaking harmful, offensive truth is inversely proportional to how much we care for the people with whom we interact. Thus, particularly in so-called “social media” where we interact at a distance with people who are very nearly strangers to us, speaking some manner of truth — perhaps objective truth, perhaps only perceived truth — in order to offend, in order to provoke, in order even to antagonize, has become something of a diabolical art. I struggle against the tendency myself, and have given in to it more often than I care to admit, but I’m trying to get better. It’s not easy sometimes to be both truthful and kind, but I hope we figure out how. Have a great week! Tagged quotes, social media. Bookmark the permalink.